Over the course of Computex, manufacturers of memory modules and motherboards alike took to the show to showcase the latest developments in high-speed quad-channel memory configurations. Powered by Intel’s new Skylake-X CPUs, manufacturers have been able to get quad-channel data transfer rates running at 4000 MT/s and higher. This increased memory bandwidth should, in turn, help Intel’s new Core i7 and i9 processors offer significantly higher performance than predecessors in applications that heavily rely on memory transactions. Quad-channel memory sub-systems on Intel’s high-end desktop processors have always provided vast amounts of memory bandwidth to multi-core CPUs, even without running DRAM at high data rates. A 256-bit memory sub-system using DDR4-2400 modules has a throughput of 76.8 GB/s. To match it, a 128-bit (dual-channel) memory sub-system would have to use two DDR4-4800 modules. Meanwhile since quad-channel memory by definition provides loads of bandwidth, and due to stability/reliability concerns, Intel opted not to chase high data rates on their first-gen DDR4 controllers found in the Haswell-E and Broadwell-E CPUs, which is why such processors barely supported DDR4-3200+ memory. With the Skylake CPUs for consumers however, Intel introduced its second-gen DDR4 controller that could handle high data rates and several DRAM module makers quickly rolled out DDR4-4000+ DIMMs for enthusiasts. That controller has evolved with the Kaby Lake generation and ended up in Intel’s Skylake-X processors, enabling Intel’s X299 HEDT platform to support DDR4 modules at well-beyond JEDEC-specified data rates. 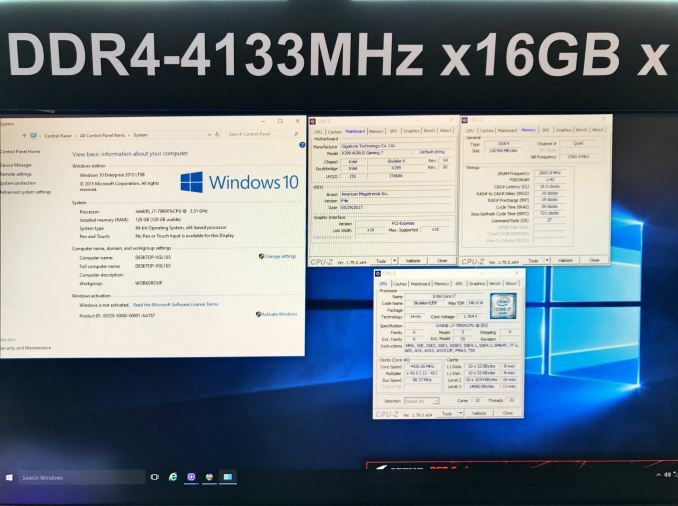 Fittingly, at Computex, motherboard and memory manufacturers demonstrated how well their high-end X299 platforms and DDR4 DIMMs can work together at high-speeds in quad-channel mode. 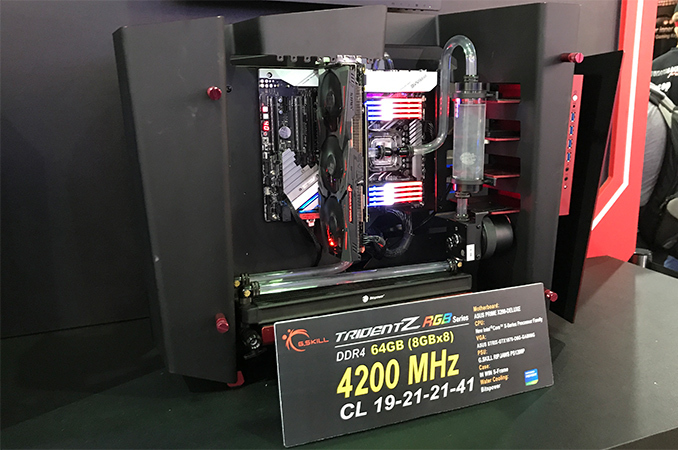 Starting things off, G.Skill displayed eight of its Trident Z RGB 8 GB DDR4 modules running in quad-channel mode with a Skylake-X CPU on the ASUS Prime X299 Deluxe at 4200 MT/s with CL19 21-21-41 timings. The CPU was cooled down using a custom liquid cooling system and the PC worked for hours during the show. 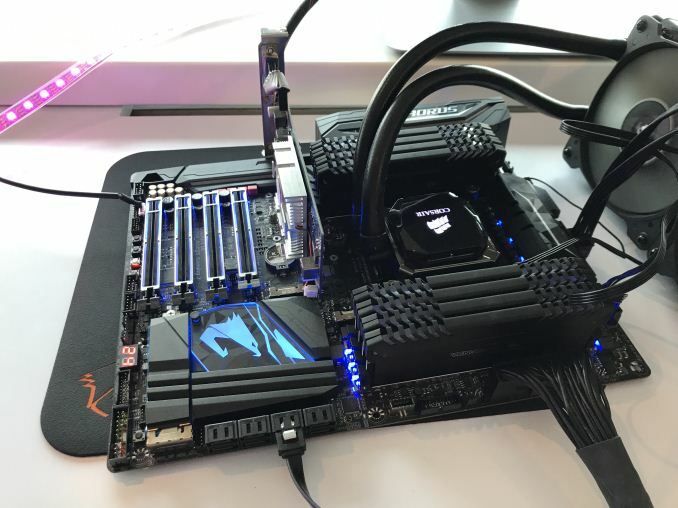 The company also showcased its modules running at 4000 MT/s, 4400 MT/s and 4500 MT/s in dual-channel mode on Intel X299-based motherboards from ASRock and GIGABYTE, which is an important news for those planning to use Intel's Kaby Lake-X processors. 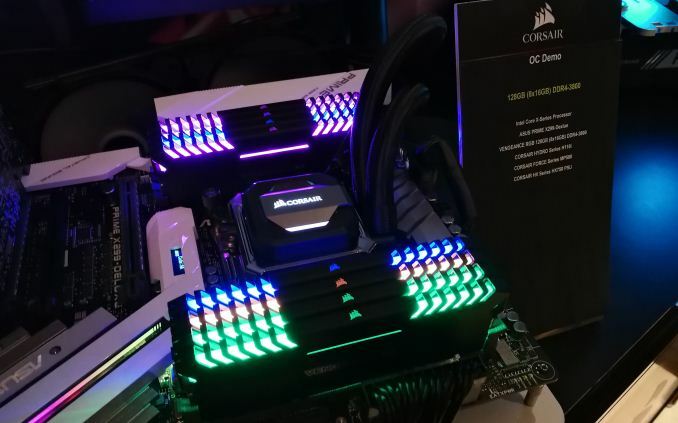 Meanwhile GIGABYTE demonstrated its X299 AORUS Gaming 7 running 128 GB of Corsair Vengeance RGB DDR4 memory at DDR4-4133 with CL19 19-19-39 latency settings. The setup was based on the Core i7-7900X (10C/20T) processor operating at 4426 MHz under an LCS, and was running for hours in Gigabyte's air conditioned suite in the Taipei 101. Corsair itself was a little more conservative than GIGABYTE. In its suite, the company displayed an Intel Core i7-7800X (Skylake-X, 6C/12T) and ASUS Prime X299-Deluxe-based system running 128 GB of its Vengeance RGB memory in quad-channel mode at 3800 MT/s. 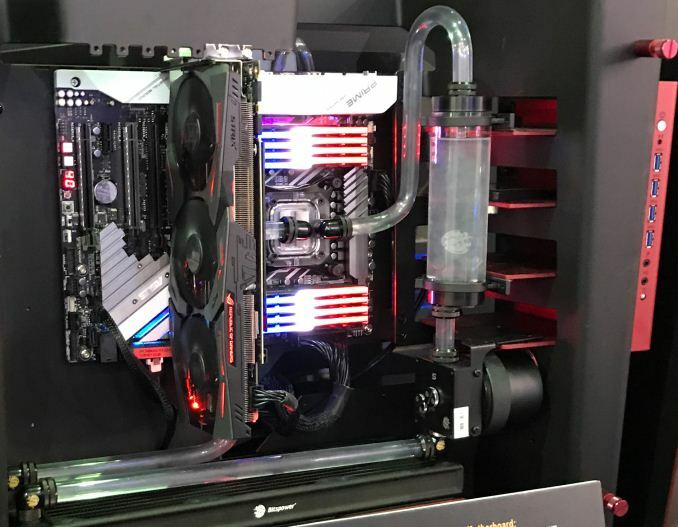 The CPU was cooled down using Corsair's Hydro H110i AIO LCS, so nothing too extreme. 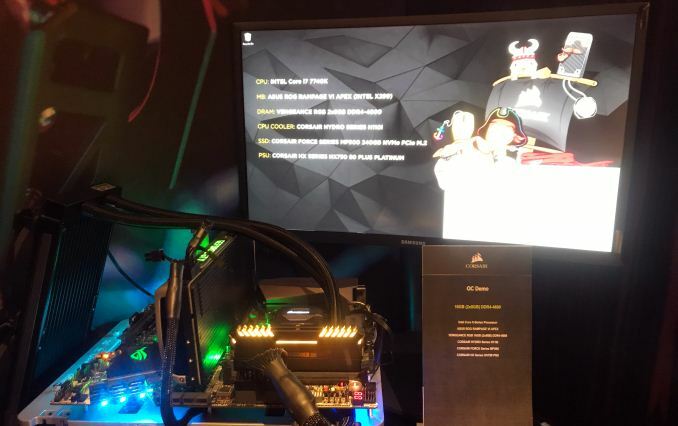 In addition, the company showcased two of its Vengeance RGB DIMMs running in dual-channel mode at 4600 MT/s on a system featuring Intel's Core i7-7740X (Kaby Lake-X, 4C/8T) and ASUS' ROG Rampage VI Apex motherboard. Again, the CPU used the Hydro H110i AIO LCS and the room temperature was normal. Obviously, demonstrations of overclocked systems do not necessarily reflect the formal plans of companies like G.Skill or Corsair when it comes to the Intel X299 platform in general, and for the Intel Skylake X processors in particular. Modules Motherboard Channels Data rate Latency Kit Capacity Kit Config. What we do understand today is that the Skylake-X can handle DDR4-4133 and DDR4-4200 speeds in quad-channel mode, whereas the Kaby Lake-X CPUs can go even north from that and hit something like DDR4-4500~4600 in dual-channel mode. 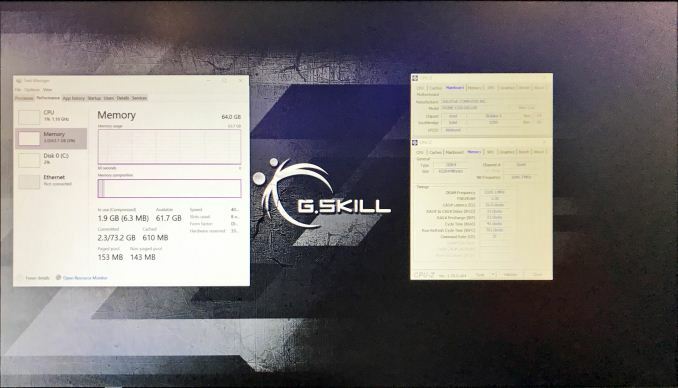 In fact, Taiwanese overclocker Toppc has managed to push a single 8 GB G.Skill Trident Z RGB module to 5500 MT/s on MSI’s X299 Gaming Pro Carbon AC (MS-7A95) using Intel’s Core i7-7740K CPU under liquid nitrogen, which proves that DDR4 is gaining overclocking potential as memory controllers get better as well.